Any company that makes Inc. Magazine’s list of the fastest growing privately owned businesses six years running must be doing a lot of things right. For 4Wall Entertainment, which has made this prestigious list every year since 2010, one of those things has been the commitment to maintain an inventory that includes quality lighting fixtures for every application. 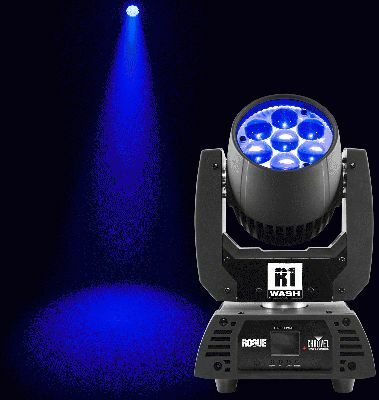 In keeping with this commitment, the company has added 44 Rogue R1 Washes from CHAUVET Professional to its inventory. As a company focused solely on entertainment lighting, 4Wall Entertainment takes pride in maintaining a rental inventory that represents the latest technology and value for its clients. The Rogue R1 Wash allows the company to offer clients a high-output moving LED fixture that includes performance features not ordinarily found at its price point. For example, the fixture has a bubble lens design that enhances color rendering, as well as an 11°-48° beam angle and lightning quick movements. It is powered by seven bright RGBW 15-watt LEDs.